It's hard to find a balance between great taste and good nutrition, especially when it comes to sweet treats. Valentine's day is symbolic of oversized chocolates, sweet-hearts, and all different kinds of goodies. It's okay to indulge in a sweet treat from time to time, but overdoing it can be detrimental to blood sugars and weight. Swapping your indulges for sugar-free options may not be the answer either. The truth is that sugar-free does not always mean carbohydrate-free, and carbohydrates are the nutrients that raise blood sugars the most. Instead, opt to eat a small amount of the real thing — you'll feel satisfied and happy. In fact, some treats can be nutritious and delicious too. We asked some of our favorite registered dietitians to chime in on their favorite indulgent treats. Their response: "Anything with dark chocolate." Studies have shown that eating a small amount of cacao found in dark chocolate may have a beneficial effect on blood pressure, insulin resistance, and vascular and platelet function. The reason for this is likely due to its antioxidant and anti-inflammatory affects. Cacao comes from the fruit or seeds of the cacao tree, a small tropical American evergreen tree. The many of the benefits of cacao may not be applicable to the processed milk chocolate that we often consume in chocolate products. Commercial chocolate is a combination of cocoa, sugar, milk and other ingredients. The higher percentage of cacao in dark chocolate, the lower the sugar content, too. 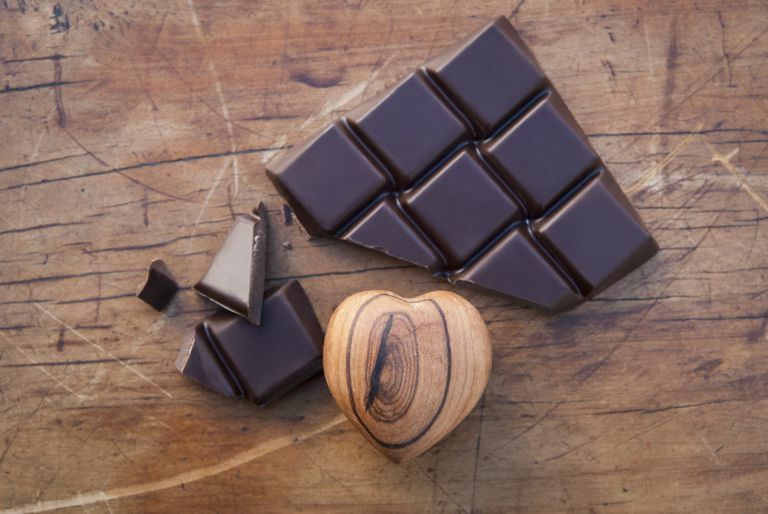 When choosing a source of dark chocolate aim to choose one with at least 70% or more of cacao to maximize antioxidant effect and reduce sugar content. Kristy Del Coro, Senior Culinary Nutritionist SPE Certified, says her go-to sweet treat is frozen (no sugar added), thawed cherries with plain non-fat Greek yogurt and shaved dark chocolate or cacao nibs. "Substitute ground cinnamon instead if you'd like to save on calories and fat," she says. If you have diabetes, limit your portion of cherries to about 15, as 1 cherry is about 1 gram of carbohydrate. Another great dark chocolate treat is to melt 1 oz of 70 to 90% dark chocolate and dip fresh strawberries (or another fruit of your choice) for added fiber benefit. Add a few chopped walnuts for added crunch, fiber, and Omega 3 fatty acids. Share this treat with someone you love. You can also try dark chocolate covered figs. Break up chocolate bars into small pieces and place chocolate in a double broiler to melt ( a metal bowl over a pot filled with boiling water works well too). Stir until melted and creamy. Line a mini muffin tin with wrappers and place 1 teaspoon melted chocolate at the bottom of each one. Place in the fridge to cool for at least 10 minutes. In a bowl mix the almond butter and powdered sugar until combined. While the chocolate cools, take 1 teaspoon of almond butter mixture and roll into a small ball, then flatten into a disc. Repeat to form 15 discs. Place an almond butter disc on top of the hardened chocolates and then cover with the rest of the melted chocolate. Sprinkle the tops with a touch of salt and return to the fridge to set. What If You Don&apos;t Like Chocolate? Perhaps you are not into chocolate and typically go with sweetheart candies, jellies, or other types of sugar candy on this holiday. If you have diabetes, these are probably some of the worst things to be eating. Loaded with sugar, artificial coloring and really nothing else, these types of candies will cause blood sugars to rise rapidly. Instead of snacking on these, perhaps you can make yourself and your loved one a special dessert. Corti R, Flammer AJ, Hollenberg NK, Norman HK, Thomas LF. "Cocoa and cardiovascular health." Circulation. 2009; 119: 1433-1441.